Previously, I’ve written short introductions to numerical trajectory optimization here and here—if you’re unfamiliar with the basics, I recommend you check those out first. 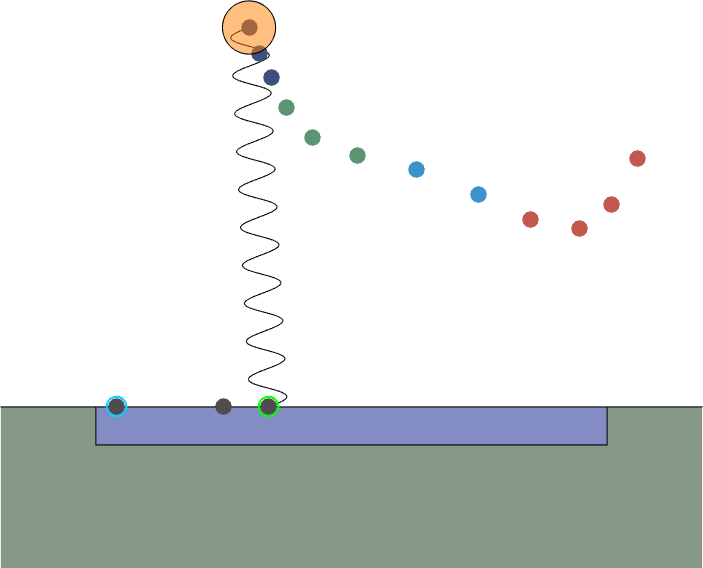 This write up expands upon a section of my research paper (which I hope to finish soon) and is meant to be a walkthrough of how to apply numerical trajectory optimization to real-world scenarios. 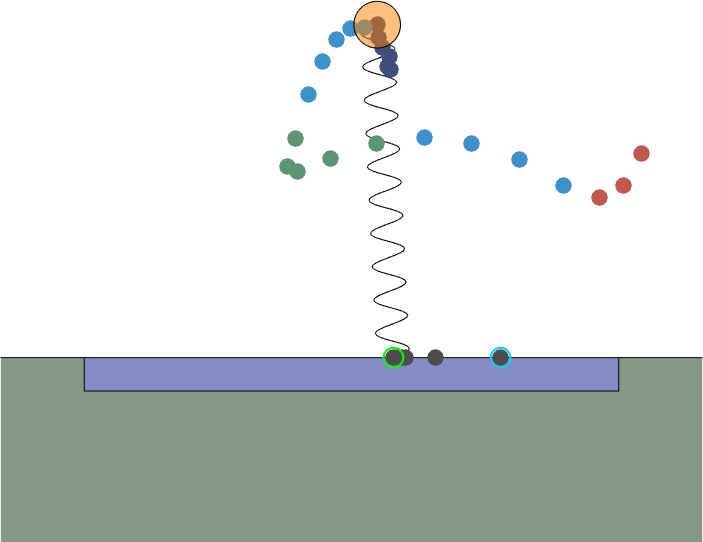 The Spring Loaded Inverted Pendulum (SLIP) model is often used to approximate human running dynamics. Fundamentally, SLIP hoppers represent the mass of the torso as a point at the hip and connect the hip to the foot via a spring. In other words, the biped becomes a pogo stick, bouncing from foot to foot with each step. How should the SLIP traverse the patch? 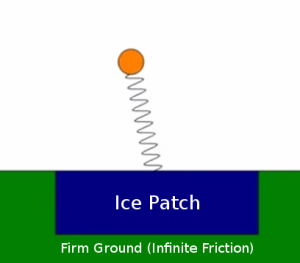 We consider the case where a running planar biped steps on an unforeseen ice patch, surrounded with high-friction ground on each side. The question then becomes this: should the robot attempt to use its momentum to traverse the patch in one step, or first step backwards and then launch itself over the patch to the other side? The SLIP model used in the optimization. Before constructing the optimization problem, we need to know the dynamics of the system. A “phase” represents a section of a trajectory with continuous state and one set of governing equations. Three different types of phases are possible in this system: standing on ground, slipping on ice, and flying through the air. Since the first two cases are similar, we will first handle them together and then discuss flight phases. Where the serves as a smooth approximation of a sign function, whose discontinuities create convergence difficulties for the optimizer. 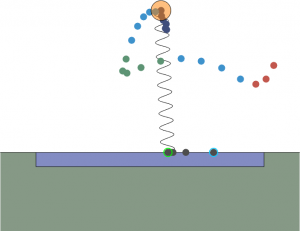 This concludes the SLIP dynamics during both slippery and high-friction stance phases. Where all “to” subscripts represent takeoff states and all “land” subscripts represent landing states. 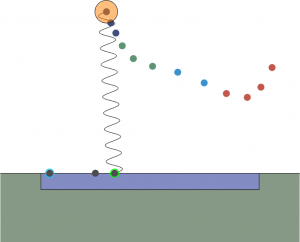 The ground reaction force must be positive within a phase for ground contact to occur. The only exceptions are the last nodes of stance phases that have a flight phase following them (instead are equality constrained to zero). The last node of the last phase, however, does need the GRF inequality constraint. 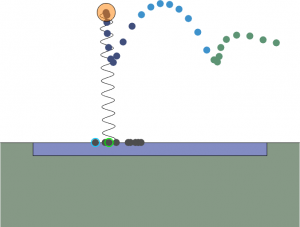 Prevents unreasonably large GRF forces that might damage the robot. There also need to be constraints governing phase transitions. Since the flight dynamics are solvable in closed form, this ultimately amounts to linking the end of one stance phase to the beginning of the next in a way which obeys the flight dynamics. Discretizing the state along the flight path is unnecessary. As mentioned previously, the flight time parameter here is really critical. I first fooled around with a bunch of different strategies (for example parameterizing a completely separate landing state, with the landing angle and length inferred from the first node of the next phase, and then equality constraining the two). None converged reliably; many thanks to Christian Hubicki for pointing me in the right direction here. The best method turned out to be evaluating the end state of the ballistic flight trajectory from the take off state and flight time, and then equality constraining that with the first node of the next stance phase. The specific variables that were constrained from the flight phase were , , , , and . 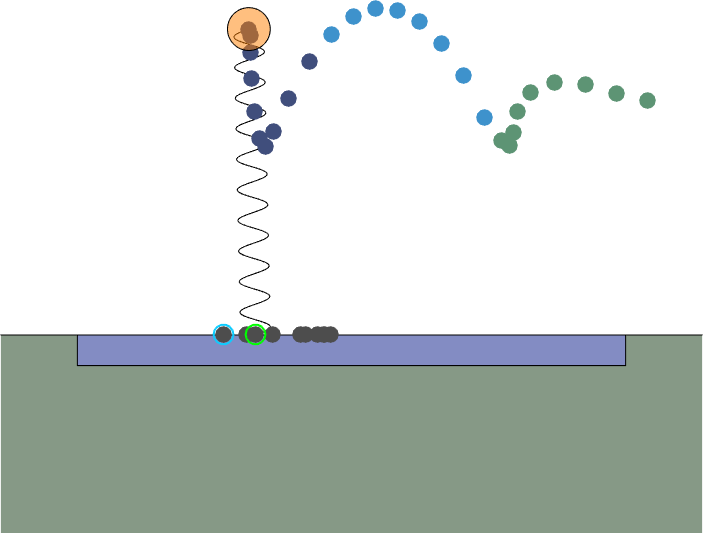 The ground reaction force at takeoff and at touchdown are constrained to zero, and is constrained equal to at touchdown. There are a few more variables and constraints that are important to note. Each stance and flight phase had a time parameter, which was bounded using the lower bound and upper bound arguments to fmincon. Similarly, the max/min actuated leg length second derivative and hip torque were also bounded in the fmincon bounds arguments. The toe x position was bounded to be within the ice patch for the slippery phase and outside for the sticky phase. The initial SLIP state was constrained to a starting position over the ice patch, and the final SLIP x and toe x were constrained to be slightly to the right of the ice patch. Where is the number of stance phases, is the number of discretization nodes per stance phase, and is equal to the nth stance phase time divided by . As mentioned previously, the trajectory optimization problem was transcribed using direct collocation with 10 nodes per stance phase. 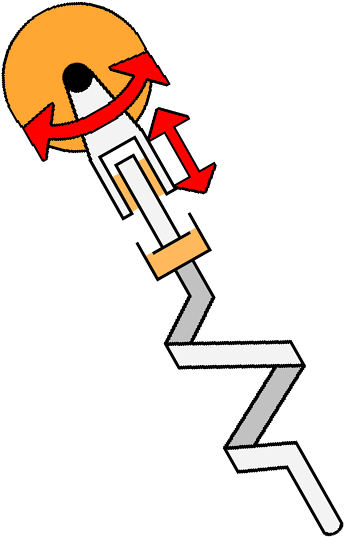 For linking one node to the next within a stance phase, dynamics were integrated using trapezoidal quadrature. Matlab’s fmincon was used for the optimization, with the SQP algorithm specified. Jacobians were symbolically calculated to accelerate convergence. The whole three-step optimization takes on the order of a few minutes to complete and converges reliably from random initial parameters. 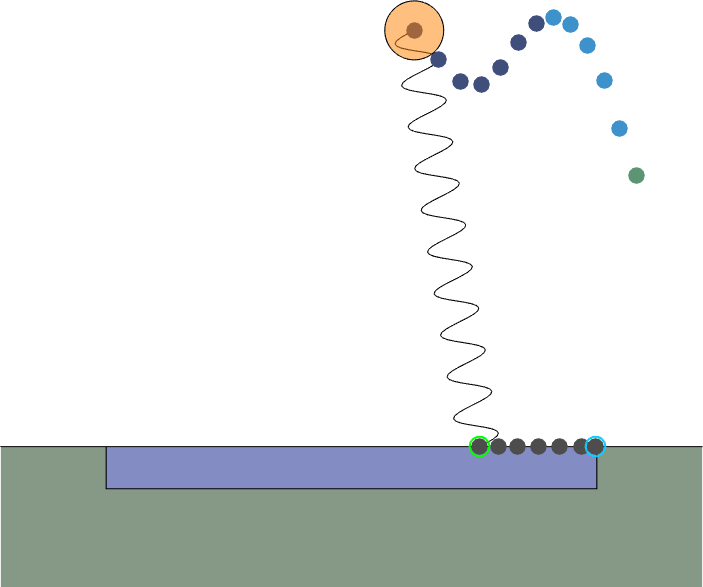 Key: dark blue (slide phase), green (first stick phase), red (second stick phase), light blue (flight phase), black (toe position), green highlight (landing), blue highlight (takeoff)—dots equally time-spaced, SLIP in starting state. Copyright © 2019 Sam Pfrommer. Powered by WordPress and Stargazer.